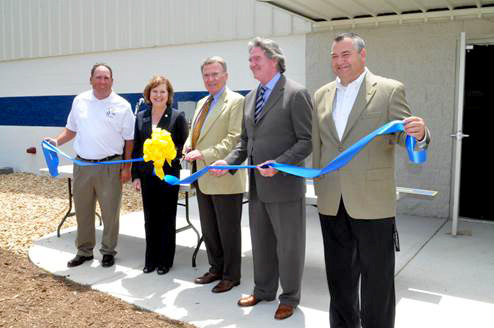 The ribbon is cut and a grand opening is held for the Ken White Indoor Athletic Facility! IT is located between the Isherwood Field House and the Ken White Softball Field. Pictured are, from left: Glen Crawford, head softball coach; Kina Mallard, president; Ken White ’61, trustee member; Billy Hasty ’67, board of trustees chairman; and William Popp, director of athletics.